Etching, 1982, a fine, fresh impression of the only known state, the full sheet, printed on Somerset Satin white paper, with margins, hand-signed with the initials and numbered in pencil beneath the plate, executed in an edition of only 14 (there were also IV Artist's Proofs), printed by Terry Wilson at Palm Tree Studios, London, with their blindstamp, published by James Kirkman, London and Anthony d'Offay, London, in fine condition, framed. Birmingham, Waterhall Gallery of Modern art, Birmingham Museum and Art Gallery, Lucian Freud Etchings 1946-2004, 29 January - 02 May 2005, no.12, another example. Kendal, Abbot Hall Art Gallery, Lucian Freud Etchings 1946-2004, 25 June - 25 September 2004, no.12, another example. Edinburgh, Scottish National Gallery of Modern Art, Lucian Freud Etchings 1946-2004, 02 April - 13 June 2004, no.12, another example. Figura, Starr. Lucian Freud: The Painter's Etchings. 2007, New York, The Museum of Modern Art, p.55, plate 24 illustrated (another example). Hartley, Craig. 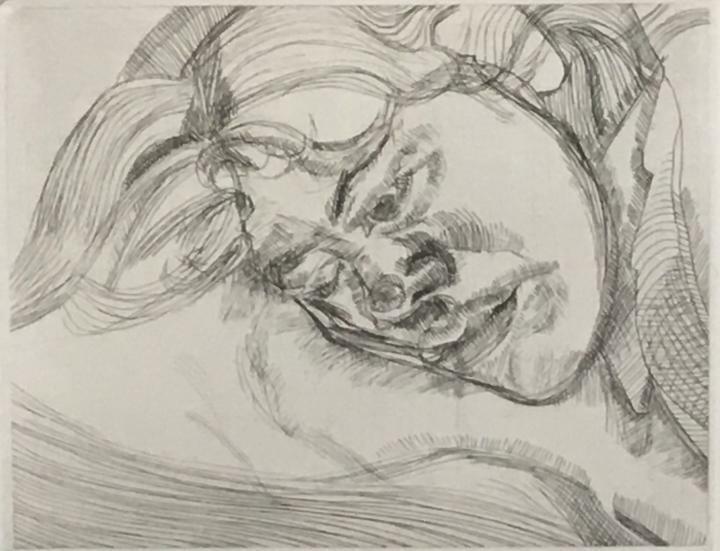 Lucian freud Etchings 1946-2004, 2004, Edinburgh, National Galleries of Scotland, The Fitzwilliam Museum, Cambridge in association with Marlborough Graphics, London, no.12. Hartley, Craig. The Etchings of Lucian Freud. A Catalogue Raisonné 1946-1995. 1995, London, Marlborough Fine Art, no.16 (another example).